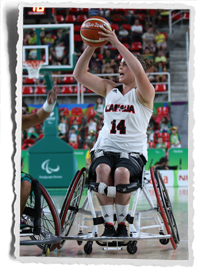 (Rio de Janeiro) The Canadian women’s Paralympic wheelchair basketball team will collide with the Netherlands in the quarter-finals at the Rio 2016 Paralympic Games on the heels of an 82-49 win against host nation Brazil at the Rio Olympic Arena on Monday. 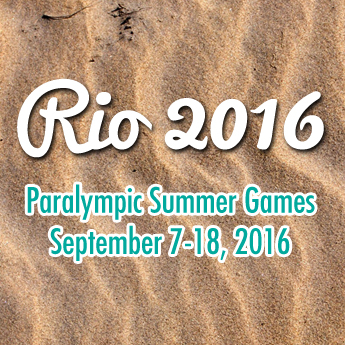 Canada and the Netherlands will square off on Tuesday at 11:45 a.m. BRT at the Rio Olympic Arena. The teams last met at a major international event in a thrilling semifinal at the women’s world championship in 2014, with Canada emerging victorious by a single point. The win against Brazil placed Canada in a three-way tie for first place in Group A with Germany and Great Britain, all with a record of 3-1 after preliminary round play, with Canada falling to the third spot in the pool courtesy of a point differential tie-breaker between the three teams. Canada started its final round robin match determined to push the pace against Brazil and take the energetic home crowd out of the game. 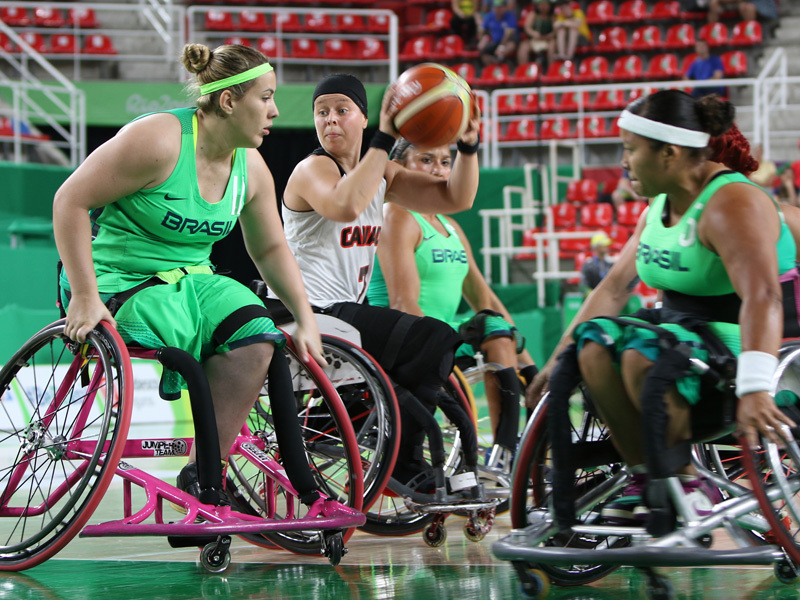 Canada carved out an early lead by doubling up on Brazil, 24-12, after the opening quarter. The Canadians turned up the tempo in the second frame, nearly scoring at will from the paint as Brazil struggled to keep Canada outside of the key. ada entered halftime with a 49-22 advantage. With the game firmly in their grasp, the Canadians used their full depth of their bench down the stretch to cruise to the win. Young had a game-best 22 points for Canada. Teammate Cindy Ouellet (Quebec City, Que.) picked up a double-double with 20 points and 12 assists. Janet McLachlan (Vancouver, B.C.) also had a double-double with 16 points and 10 rebounds. Vileide Almeida scored 12 points to lead Brazil. The Canadian men’s Paralympic wheelchair basketball team completed pool play on Monday night with a 67-46 loss to Turkey at the Rio Olympic Arena. Canada (0-5) will play Algeria (0-5) to decide 11th place at 9:30 a.m. BRT on Wednesday. “We all had high hopes to accomplish a little bit more here,” said Team Canada co-captain Bo Hedges, of Wonowon, B.C. “We still have one more game and we have to continue to improve like we have throughout this tournament. It’s a great group of young guys and a great opportunity to play Algeria and to keep going and keep building. Canada stayed with Turkey through the opening half, trailing by five points at halftime, 29-24. Turkey broke the game open in the second half, utilizing its size advantage over Canada to convert on scoring opportunities in the paint and on the fast break. The Turkish side widened to gap to a 14-point lead, 51-37, after three quarters of play and put the game out of reach in the final frame. Canada’s David Eng (Montreal, Que.) led his team with 15 points, while Nik Goncin (Regina, Sask.) added eight points. Ozgur Gurbulak had a double-double for Turkey with 18 points and 10 assists.